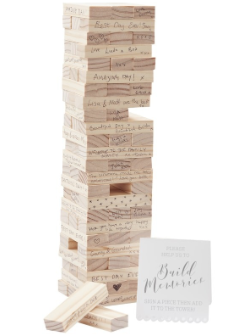 Have fun with your loved ones on your wedding day with the unique Building Block guestbook! 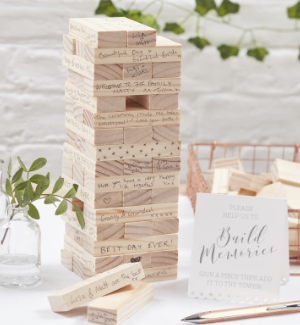 Your guests can use the blank wooden blocks to write their wishes to the newly weds, then build a tower with your special messages. Great fun on your wedding day and the perfect keep safe to ensure that you can relive your special day for years to come. Each pack contains 72 wooden blocks which create a wooden tower. When complete tower measures: 9cm (W) x 36cm (H) x 9cm (D).